A.M. My good old friend and training partner Ben Crozier was in town. He joined me this morning. This helped quite a bit, as Ted was out of town, and my Uneventful Half-Marathon would have been very uneventful otherwise. Ben is still not married, so Sarah and I gave him a lot of teasing about it, as well as practical advice. Even my son Benjamin joined, and offered some of his. Benjamin joined us for the first 2 miles. The first one was rather uneventful even for Benjamin - 8:08. On the second he decided to show class and gradually wound it up hitting a 7:24 split, total time 15:32. Then we ran another 8 at a slightly faster pace. I gave Ben a long lecture on the importance of sleep, and taking it easy on easy runs. He argued with me that he needed to do more speed work, then he'd be faster. I just has a hard time believing that a former 15:45 5 K runner that is not currently overweight would have those issues, and suggested a test. We ran a bit at what he thought was his 5 K race pace. He ran about 0.1 at 5:20 pace, which was about what I expected to see. Then after some rest, and further into the run, I did another demonstration setting a 6:00 pace and asking him to hold it for as long as he could. He made it through 500 meters, which was also about what I expected to see. This showed that the reason he recently raced a half marathon at 6:43 pace was more in not being able to hold the pace, than in the lack of speed. The main reasons for such a failure are lack of aerobic conditioning, lack of sleep, and lack of proper carbo-replenishment. So he is going to work on all three. Dropped Ben off 10 miles total into the run (1:13:22), then added another 3.11 with 8 strides in the middle, total time for the half was 1:34:58, 7:14.63 avg. P.M. 1.5 with Jenny in 14:49, 1.05 with Julia in 10:36, then put Jacob in the stroller and ran 3.62 in 27:08. A.M. The Big Workout. An interesting day. I would say a different day for a number of reasons. On the light side of the matter, Ben Crozier joined me again, as well as Karl Jarvis. Ben adds to the light side. If there were jobs for running comedians he would be one of the leaders in this profession. He provides constant live running entertainment. Benjamin ran the first two miles with us in 16:32, then we dropped him off and continued for another 4.12 hitting the 6.12 mark in 46:09. Then it was time for my 7.5 tempo run. This was the more serious side. Not so much because of having to run hard, that is a given in the Big Workout. The thoughts of Ryan Shay, his life and his death were on my mind. I knew the 5.5 mile mark would be special. I feel connected to every runner. I feel particularly connected to a competitive marathoner. I feel even more connected to a runner that does not have the most talent but makes up for it with work. I feel particularly connected to a front runner that is not satisfied to sit in a slow moving pack in a tactical race. Additionally, I found out that Stephen Shay who runs now for BYU is Ryan Shay's brother. So even though I had never met Ryan, his death hit close to home. But at the same time I had a feeling of perfect peace. I know that this life is only a temporary period of probation. We have already proven our ability to make good choices when we can see God. Now is the time to develop our ability to make good choices while we cannot see God, thus developing our faith. It is through faith only that most people are able to know that there is life after death, and thus we mourn those who depart because we do not scientifically know where they went, yet we can know through faith. I felt I knew through faith, and it was good enough. My mind was at peace. The tempo run started at a leisurely pace. 5:43 for the first mile. It started getting warmer, the sun was out, there were much fewer leaves on the ground. I picked it up a bit and hit the 2.5 mark in 14:11. Not bad for uphill. On the way back, all I wanted to do is stay with the 5:40 guy. But I ended up getting into good rhythm, and started seeing 1:22 quarters quite often pretty soon. Decided no reason to back off if I could sustain it with a reasonable degree of comfort. Ran the next 2.5 in 13:47. On the way back I maintained a steady effort after recovering from a 180 turn, holding 5:36 pace, then winding it up to 5:32, and then 5:30 on the last mile which has a slight uphill. This gave me 13:54 for the last 2.5, 27:41 for the last 5, and 41:52 for 7.5, avg. 5:34.93. Overall had a very hard time distinguishing between threshold and marathon pace. Something has changed. Faster pace that should be threshold felt easier and sustainable, and I was able to sustain it for long enough, and accelerate from it well enough to put it under marathon pace category. So I am going to say 2 miles of the tempo were at threshold. This is the fastest time I've ever run on this tempo. The previous fastest time was 42:02, most of it was done trading quarters with Jeff vs. running alone, the last two miles were intentionally threshold, there were no leaves on the ground, it was productively warmer, and I felt I had worked harder. So it appears I am starting to get into better than pre-St. George shape. Now it is a matter of not blowing it before St. Jude and caching out on the fitness. Ran 1.38 home in 10:17, total of 1:38:19 for 15 miles, avg. 6:33.27. P.M. Jenny and Julia wanted to run by themselves around the block. So we let them. They ran 1.05 in 10:25 first together, then Jenny added another 0.7 to get 17:00 for 1.75. Benjamin joined her for the last 0.7, but was too impatient and took off finishing the segment in 6:10. Later I ran 6 miles with Jenny following me on a bike and Jacob in the stroller in 42:59. Starting to think of 120/week as standard training mileage rather than high mileage. A.M. A really uneventful easy 10.1 at 5:10 AM alone this morning, most of it in the dark in 1:13:46, avg. 7:18.22. I suppose watching the sunrise was the most interesting event, that, and wondering if perhaps the rustling of the leaves was coming from the wind or from some wild animal in the bushes. P.M. 1.5 with Jenny in 14:20, 1.05 with Julia in 10:57, 2 with Benjamin in 17:44, 3.6 first by myself, then found a couple of UVSC runners on the trail and joined them for about a mile - 27:13 for the stretch. A.M. The Big Workout. Alone at 6:40 AM. Wore shorts, long sleeved, a jacket, and gloves in the warm-up. Ran 6.22 in 42:45. Then figured the weather was warm enough to take off the gloves and the jacket for the tempo. More leaves on the ground than Tuesday, but not the highest I've seen. Tempo run was 5 miles. Started at the Utah Lake trail gate as usual. First mile was leisurely - 5:37. Felt good, but not looking forward to picking it up. It was still quite cold. Gave myself a bit of a kick in the pants, and that kicked me into gear. Next mile in 5:34 with some uphill in it. Ahead of the 5:36 guy, that's good. Next half in 2:47, 13:58 at the turnaround. Good recovery from the turnaround. First quarter in 1:23, then got into a good rhythm, no quarters slower than 1:21 all the way to the end. 16:42 at 3 miles (5:31), then 5:21, and 5:19. On the last mile hit the leaves in the first half and slowed down to 2:42, but then made up with a 2:37 closing half. 27:22.8 for the whole run, avg. 5:28.56, last half in 13:24, avg. 5:21.6, actual negative split of 34 seconds, profile-adjusted negative split of 27 seconds. I am starting to wonder if the difference between directions for the 2.5 stretch is 10 seconds rather than 7. I am fairly certain about 7 seconds for the first mile starting from Geneva road - I've done mile repeats on it and consistently hit splits that were 7 seconds faster going towards the lake than the other way. But I am starting to suspect that the remaining 1.5 stretch favors the direction towards the lake by a couple of seconds. It looks flat, but I know that one quarter of it favors the direction towards the lake by 0.5. I also noticed that I hit slightly faster splits with the same effort when going towards the lake regardless of which direction I go first. I was happy to have run the last 4 miles in 21:45. Last year I raced the Thanksgiving 4 miler in 21:50. Around the same time, I did a similar tempo run with a positive split in 28:18, hitting the same 4 mile stretch in 22:33. Ran 3.88 cool down in 26:34. Total time for 15.1 was 1:36:50, avg. 6:24.77. P.M. Ran with the kids and some on my own. Total of 5.25. Kids times - Julia 1.05 in 11:38, Jenny 1.75 in 16:24, Benjamin 2.1 in 17:22. On the first day of running with Sasha Sasha said to me - Ben, you are running too slow. I need to water a tree. Ben, why aren't you married? (He still is not, single women interested in a 30 year old guy in good condition, take notice). Let's run a five mile tempo! I am missing three days - have to ask Ben and Dallen to see if they still remember. A.M. The Inaugural Uneventful Half-Marathon with participants other than me and Ted. Jamie and Michelle joined us. They even warmed up. Also Adam joined us for the first three miles. I think men retain their show-off in front of ladies instinct even after they've been married for a while. We hit our first quarter in 1:59 instead of the usual 2:10. Then the ladies started to push the pace, so we had to pick it up. First mile in 7:34, followed by 7:07. I did not expect we would be going that fast, but that was just fine. Then soon the pace settled into a steady 7:00 groove. I had to take a VPB stop around 2.5 while the pack continued. It took 32 seconds. At first, I thought I could quickly catch them cruising at 6:30 pace. Then I realized they were going 7:00, so I figured I would have to do it with the siren and the flashing lights. Sped up to 5:36 pace, and caught the pack soon enough to give them their 3 mile split. After the catch-up move, 7:00 pace started feeling a lot slower, and I was going to swear the pack has slowed down, but they did not - 7:00 pace right on. And the ladies were still very conversational. It was very clear that they've gotten into much better shape since St. George. 36:03 at 5.05, and 44:06 at 6.22. Then it was time for the strides. Ted and I did the strides, while the ladies kept us honest on our recoveries with a fire-breathing chicking threat from behind. Did 8x100 averaging around 17-18 seconds. The form is starting to feel good, I was enjoying the strides for the first time since I started doing them, and the pace did not feel as sprinty as it used to. Then around 8.75 Michelle's BYU team killer instinct began to break through. She picked it up to 6:40. After about a mile, Jamie decided to back off. Unfortunately, the course directions I gave her were not adequate, and she ended up getting lost. We'll do better next time. Michelle continued to push the pace maintaining a solid sub-7:00 up a 1% grade. Then once we turned around, she used the downhill to pick it up to 6:40. On the last mile she started chasing the imaginary 1:31 girl. After some thought I upgraded the girl to a guy, if you can say that, well a guy is harder to get than a girl, and brings more credit to the chaser, so I guess we can call than an upgrade. Then I decided the guy should have a name, so I called him Tom. She ran the last mile in 6:20 finishing the half in 1:30:52. This is her record-eligible course PR, which I imagine is worth about 1:27 on the TOU half course. Her last 10 K, according to Ted's calculations was 42:30, which is almost as fast as what she did in the Payson Onion Days 10 K. Clearly some serious progress in the last two months in spite of running a marathon in the middle. P.M. 2 miles with Benjamin, Jenny, and Jared in 17:46. Pushed the double stroller. Joseph rode in it. He enjoys the ride, but not the process of being captured and strapped into the stroller. Jenny ran 1.5 in 13:29. Jared ran all the way. Benjamin picked it up with 60 meters to go, and finished in 17:41. Then 1.05 with Julia in 10:57. Then 3 miles by myself in the dark in 22:26. Tomorrow I am running 20 starting at my house (339 N 1120 W in Provo) at 6:00 AM. Ted will not be able to make it. Start easy, then brisk easy, then after the turnaround at 10, consciously hard. Call 801-788-4608 before 10 PM tonight if you want to join me for part of it, or all. A.M. Standard 20 miler from my house to Bridal Veil and back. Ran the first half on the border line of true easy and brisk easy in 1:08:56. Once warmed up and out of the tunnel maze, was going 6:40 when the headwind was mild to none, 6:50-6:55 with moderately hard headwind, and on the last mile slowed down to 7:10 with the headwind becoming stronger and the uphill steeper. On the way back kicked into gear right away, hit the first mile in 5:38, then 5:32, 5:35, 5:31, 5:36. This gave me 27:52 for the first 5 of the tempo portion - 310 feet steady elevation drop. Then I let the horses loose with the intention to negative split the 10 mile stretch. This would be tough - only 240 feet of net drop, and it is rolling with 2 miles of tunnel maze. Next two miles were 5:29, and 5:30. The 5:30 one had the uphill near the cross-country club, I hit that uphill quarter in 1:25. Another half in 2:45, and then I was stuck in the tunnel maze with the leaves on the ground to make things worse. I think the biggest problem, though, was the broken rhythm, and I realized how much I rely on rhythm when fatigued. Next half in 2:53, 5:38 for the mile. Another half in 2:52, and now one more tunnel to go. Was able to shift gears and get going again. Next half in 2:44, 5:36 mile. The last mile had a tunnel and leaves afterwards. So the tunnel broke my rhythm, and then the leaves made it hard to find it again, but I eventually did. Managed 5:33 on the last mile. 55:38 for the last 10 (avg. 5:33.8), 27:46 for the last 5 (negative split, avg. 5:33.2), 2:04:34 for 20, avg. 6:13.7. Then we went to Sarah's 5 K race. It was a stake 5 K supposedly organized by Amanda's stake. At least it was on the program. But nobody, including the person in charge who was unknown, showed up except Sarah, Amanda, Amanda's husband Derek, Benjamin, and another guy in their ward who we actually happen to know - his name is Todd. Fortunately enough, we were right next to the Provo River Trail, and I know all the marks on it well enough to create on the spur of the moment an out and back 5 K course that would pass USATF certification. So that is what we did. Todd went ahead and walked it on his own. Derek, Amanda, Sarah, and Benjamin ran a race starting together, and timing themselves with Derek being the back-up timer as well. I watched the rest of the kids. Derek won with 20:01. Benjamin was second in 24:03. He originally was supposed to pace Sarah and Amanda, but after the first mile decided the pace was too slow for him, and took off. He hit the turnaround in 11:30. On the way back he managed to take a wrong turn and run on the alternative part of the trail, which is supposedly 0.1 longer. On top of that, when he exited the detour, he made a turn in the wrong direction and ran until he met Amanda. She told him to turn around, which he did. In about 0.5 he managed to move away from her by almost a minute although she finished in 25:02 and was probably running around 8:10-8:20 pace on that stretch. Sarah had a cold, and started extra conservative, but then started feeling better and sped up to 8:10 pace finishing in 26:17 with the splits of 13:40 for the first half and 12:39 on the way back. Did a little bit of random running - some with Derek for his warm up, then from their house to the church to get the van - total of about 0.6. P.M. Ted and James came to run with me. Pushed Jacob in the single stroller the entire time. Ran 1.05 with Julia in 10:43, while Jenny, Ted, and James ran ahead. Then added another 0.35 untimed. Jenny ran 1.55 in 12:48 with the last 0.5 in 3:48. 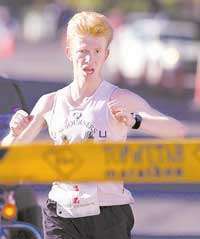 Ted said her form was good, she looked like a miniature female elite runner, and she was not breathing very hard. Then joined Ted and James for a portion of James' speed workout. He was doing 2x1 mile in the middle of 9.5 run. I just ran 2.5 out and back. This section included the first mile repeat. Ted gave me a funny look and a comment about running a sub-6:00 mile with a stroller after having done a hard 20 miler earlier this morning. However, a single stroller with a 16 month old child slows you down only by 15 seconds per mile, so no big deal. But it sure created some motivational element of James. Ted and I kept rubbing in the fact that if I could do my 24th mile for the day with a stroller at a given pace, James had no excuse. At one point Ted said - James, say hi to the baby. I got the clue, and made sure saying hi to the baby would not be too easy. I can only imagine what is going to happen when James has a kid of his own and pushes him in the stroller while running with Ted - Dad, say hi to the baby. Come on, this is your grandson, say hi to him! We ran the mile in 5:50. It felt very good. Then I turned around and jogged back at a slightly sub-8:00 pace. My total time for the 5 miles was 36:51.